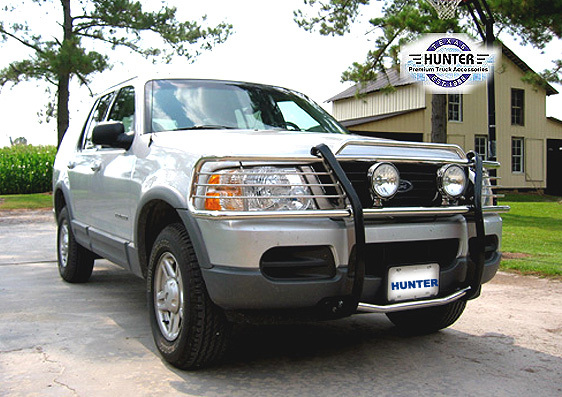 Hunter Grille Guards provide customized front end protection for the headlight and grille areas of the vehicle. Each grille guard is designed specifically for that vehicle model, contouring to the lines of the front end while providing an easy, hassle free installation with no drilling required. Mirror Polished Stainless: Marine grade T-304 stainless steel for maximum protection. Do not sale for the Mercury mountaineer..will not work. Years ago I had bought a black grill guard from a magazine ad that cost me over $400. I went looking online and could not believe what I saw from your company. I ordered the stainless steel grill to match my 20-in chrome wheels (still cheaper with shipping than the black one mind you) and got it within a few days. It looks absolutely fantastic on my new truck and could not be happier. The shine for polished stainless steel is amazing. It is comparable to the shine on my stainless Rolex watch. I have a F-150 and always wanted to put a grill guard on, but everywhere I go, shops were asking $600 for it. Not having that much money, I started looking around at some local shops but could not find many that fit my needs. Going online was the next option and it paid off. This is the best deal I have ever seen for a custom grill guard! The quality was the same as what the dealer had to offer at only a fraction of the cost. I have told all my friends about buying direct from you. Thank you again. Thank you, Thank you, Thank you!! I just got my grill guard today and it is so much better than your website shows. It is very rugged looking and makes my truck look really cool. The weight of the grill lets me know that it is really tough and can take some abuse. For the money, you cannot go wrong with your accessories and I am sure anyone who buys will agree with me. You guys are awesome!